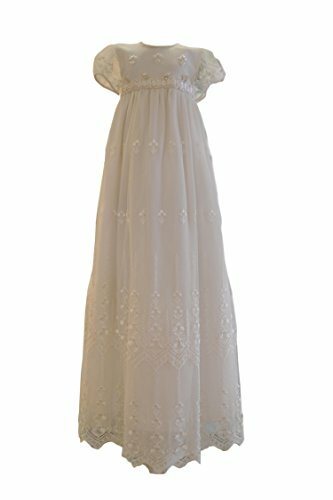 This short sleeve long christening gowns for baby girls is great for baptism, christening, fairy princess party, birthday party and other dress up party. 1. Excellent quality--superior fabric, dedicate craftsmanship, accurate measurements & complete QC system. 2. Competitive price--more quantities, more discount. 3. Fast delivery--shipped by Amazon prime. 4. High quality--choosing fabrics according to the different dresses. 5. Full refund unconditionally for any quality issue-full refund honored will be our responsibility. Any defect, damaged or mis-shipped items are eligible for a refund or exchange. Your 100% satisfaction is guaranteed, if you are not satisfied with your purchase for any reason, please contact us freely. We will reply to you within 12 hours and help you solve the problem until you are pleased. There may be a little color aberration of the goods because of some factors like the light when taking photos, the screen resolution, etc. Material: lace, cotton, tulle, satin. Embellishment: lace applique, beading, bowknot. Note: please choose the size according to our SIZE CHART of the fifth image on the left. Do not refer to "Size Chart". Please choose right style, size and color, take accurate measurements. Custom size and color are also available. If you need a custom made size and any other color, please contact us and send us your measurement or color details.